Emergencies can happen at any time, with little to no warning. Depending on the type of emergency you may need to stay in your home, also known as sheltering in place, or evacuate. Emergency responders may not be able to get to you immediately, and you may be on your own for food and water for some time. During an emergency you may be panicked and concerned for your safety as well as the safety of loved ones. The best time to prepare for a disaster is before one hits. Preparing before an emergency takes the guess work out of survival. Immediately after an emergency, items like water and batteries may be hard to find. The electricity may be off for an extended period of time. Or, you may have to leave your home quickly. Take three steps to keep yourself and loved ones safe when disaster strikes. Plan: Create an emergency plan and make sure everyone in your house knows it. 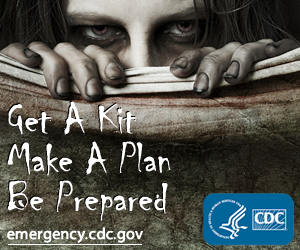 Prepare: Be prepared by having an emergency kit in your home and car. Protect: Protect yourself by doing things like getting a flu shot and regularly checking flu kit supplies. Project funded by the Illinois Department of Public Health.